PARK SLOPE — Some artists fear having children will be the death of their creative lives, but a Park Slope group is trying to encourage parents to stick to their goals. 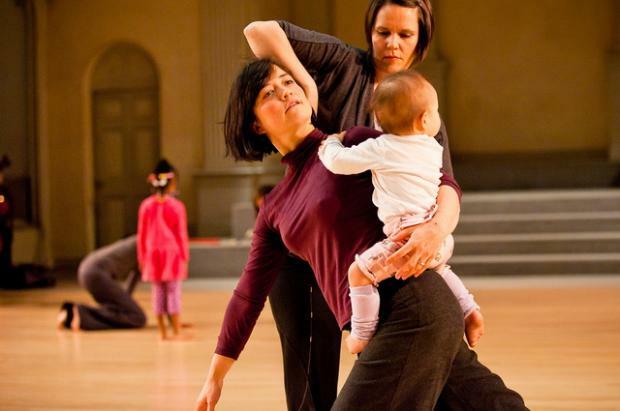 Brooklyn Arts Exchange (BAX), the dance and performance venue on Fifth Avenue and Eighth Street, is offering a grant for artists raising young children, from newborn to preschool age. "I know artists who have made the decision not to [have kids] because they’ve seen some of their friends, once they become parents, stop making art," said BAX's marketing director Fernando Maneca. "This grant supports the idea that you can do both." The grant consists of 40 hours in one of BAX's rehearsal spaces to be used from April through June of 2014, plus a $300 stipend for childcare. Now in its third year, the award has been expanded beyond choreographers and is open to theater and performance artists who use studios. Choreographer Adrienne Westwood won the grant in 2012 when her son Eden Easter was a newborn. At the time she was working feverishly to finish "Record," a dance piece she had been working on for more than two years, which was scheduled to premiere six months after her son's birth. She filled out the application when her son was just 6 weeks old and remembers answering a question along the lines of, "What challenges do you face as an artist?" with, "Sitting down to fill out this application." Westwood said she was used to pouring her whole self into her choreography and making room for her baby, though a welcome arrival, was a daunting challenge that she wasn't sure she could meet. But the BAX grant provided crucial support — a place for her to rehearse during specific hours. "I was really used to working in a very focused way…I knew it was going to feel like a balancing act I wasn't used to, so it was really nice to have a set structure in place, otherwise I would have felt very lost," Westwood said. The accompanying childcare stipend was also a "luxury" that allowed her to focus on her dance work, Westwood said. It helped that BAX seemed to "celebrate" families and children, so she didn't feel shy about bringing her son to the studio. Artists who receive the grant are required to keep journals and meet regularly with BAX leaders to discuss their experience. The self-reflection wasn't something she would have done on her own, but it helped Westwood navigate a complicated time in her life, she said. "It was really productive, not only in terms of reporting on the grant but in figuring out how to sustain working in the arts while being a parent," Westwood said. "It taught me that the way you figure it out is that you just have to do it." To apply for the BAX parent-artist grant, visit the group's website. The deadline to apply is Feb. 14 at 5 p.m.